Fans walk up the steps to Kinnick Stadium after alighting from the Hawkeye Express before a football game against Miami (Ohio) on Sept. 3, 2016. “It’s coming. It’s coming,” squealed a toddler as she clapped her hands. Within a few seconds, with the hiss of air being released from its brakes, the Hawkeye Express slid to a stop next to the young girl — a six-car commuter train, ready to take on passengers. While a common sight to daily commuters in Chicago or San Francisco, this particular stretch of track has not seen regular passenger service in decades, nor is commuter rail service even necessary in this area for 357 days of the year. 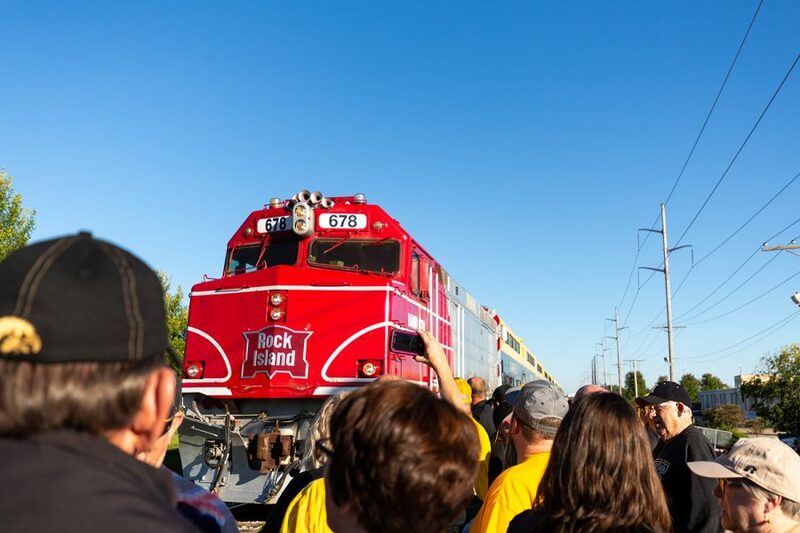 However, within a few minutes of stopping, several hundred passengers had boarded the train and with a blast of its horn, the train reversed direction and left Coralville for Kinnick Stadium. “We were running out of parking space,” retired Assistant Athletics Director Mark Jennings said. When the Hawkeye Express was first conceived in 2003 after the end of the football season, game-day ticket revenue was approximately one-third of the Athletics Department’s revenue — a larger component than it is today — and with increasing congestion around the stadium on game day, there was concern that attendance would suffer. The Athletics Department considered shuttling fans, but with an active rail line right next to the stadium, Jennings thought that might be a viable way of getting fans to and from the game. He knew that the old Rock Island Railroad — which went bankrupt in 1979 and has long since disappeared — had run its trains to Kinnick. But that had been decades ago. So, he asked, where can one get a train today? And with that, the Hawkeye Express was born. 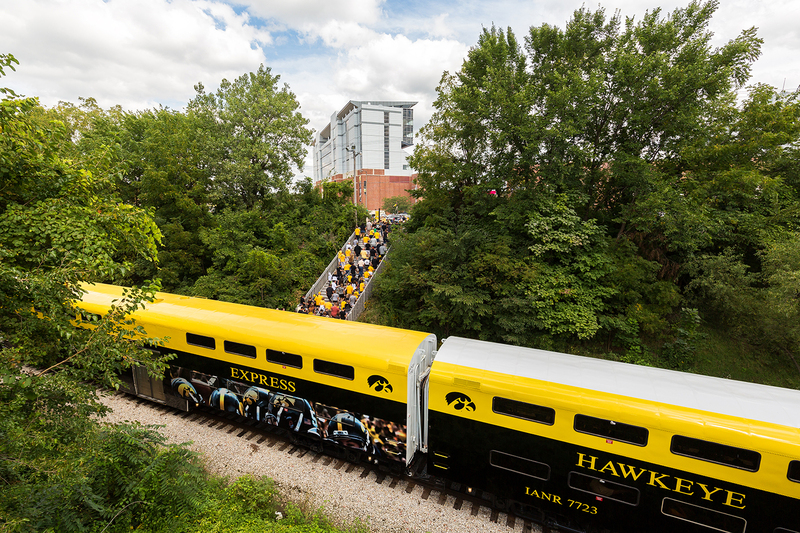 Now in its 15th year, the Hawkeye Express has become a popular way to get fans to and from Kinnick Stadium, transporting approximately 5,500 fans every home game. After parking and tailgating in the empty lots around James Street and 25th Avenue in Coralville, fans walk a few hundred feet to the parking lot of the Coralville IHOP. There they find a Hawkeye Express ticket stand set up behind the restaurant, where volunteers sell the — literally golden — ticket that will transport them both, to and from the stadium. After walking around the building they find another tent where tickets are collected and volunteers control the flow of passengers up a gravel ramp to a cleared area next to the railroad right of way. Within a few minutes of waiting, the train pulls into the makeshift station, ready to take on passengers with Kinnick Stadium as the next stop. 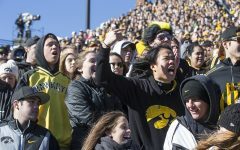 While it was originally intended to alleviate congestion around the stadium, Assistant Athletics Director Matthew Henderson said, the Hawkeye Express has led to the development of a separate tailgating culture in Coralville and has even attracted passengers who ride the train not to get to the game but solely for the experience itself. Under a cloudless late afternoon sky before the Wisconsin game on Sept. 22, fans in Coralville largely echoed the perspective from the offices in Carver-Hawkeye. 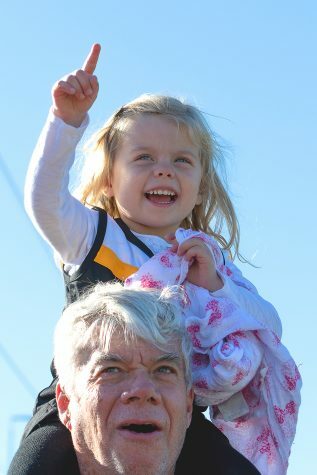 Katy Snider of Overland Park, Kansas, was riding the Hawkeye Express for a second time, explaining that while she’d previously parked closer to the stadium, the convenience of avoiding stadium traffic and quickly getting back onto the road for the drive back to Kansas was too appealing to pass up. Visiting fans seemed eager to take the train as well. Chad Linzmeyer and his friends, decked out in cardinal-and-white Badger gear, queued up for the train among a sea of black and gold. Passengers record the arrival of the Hawkeye Express in Coralville on Saturday, Sept. 22, 2018. “We really just see this as part of the game-day experience,” Linzmeyer said. 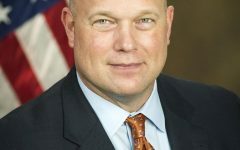 While conceding that convenience played into the decision to take the train — their hotel was in Coralville — he also said he and his friends were in the process of visiting every Big Ten football stadium, and they considered riding the Hawkeye Express as a necessary part of visiting Kinnick. Kelly Kinney’s two sons, Ellis (2) and Everett (7), would agree that the Hawkeye Express is a necessary part of visiting Kinnick — even though they weren’t going to the game. “They’re crazy about trains,” Kinney said. As the boys jostled with each other to see who could get the better view out of the window, she said she’ll occasionally bring the boys on the Hawkeye Express just for the fun of the ride. 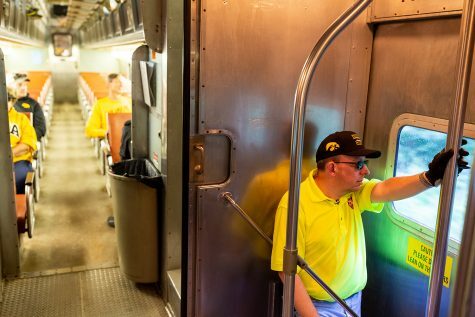 Volunteer car attendant Scott Evans watches the landscape roll by as fans ride the Hawkeye Express on Saturday, Sept. 22, 2018. As the Kinney boys gazed out the window at the Iowa countryside whirring by, other fans on the train relaxed in their seats and chatted with friends or scrolled through their cellphones as an Iowa football pregame radio broadcast crackled through the cars’ intercom speakers. The late afternoon sun streamed through the tinted windows of cars casting heavy shadows across the faces of passengers and causing some to move to the other side of the car to avoid the glare. 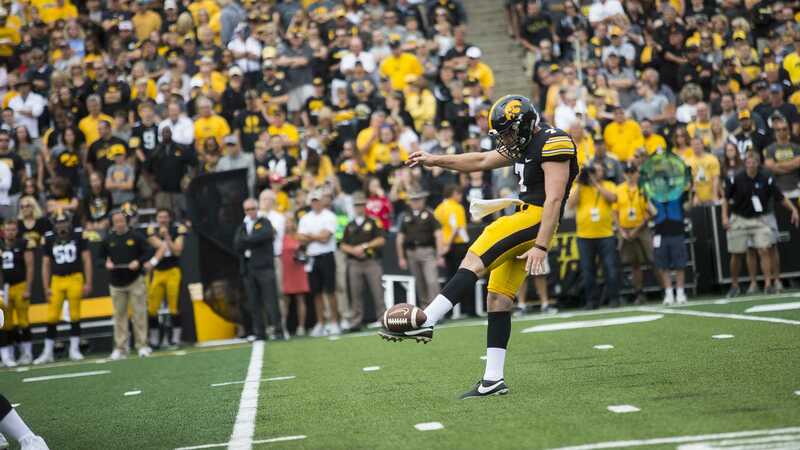 Within a mere eight minutes after gliding away from Coralville, the Hawkeye Express began to slow and a voice cut in over the radio broadcast announcing the train’s pending arrival at Kinnick. As the train pulled into the makeshift station to west of the stadium, it slowed to a crawl in order to ensure that the passenger car doors were precisely aligned with the steps at the station. With a gentle lurch, the Hawkeye Express came to a stop and the doors slid open. 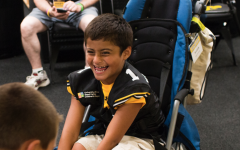 Passengers made their way down to another gravel walkway that led to a large staircase that would take them to the Kinnick parking lots where beyond, the stadium and a September evening football game were waiting. But what happened to the ski train? While now operated by Amtrak, in 2006, the Ski Train was a privately operated train between Denver and Winter Park, Colorado, that shuttled skiers between the city and the mountains during ski season. Because ski season starts after football season, the train otherwise sat idle, and the Iowa Northern was able to use it for the football season. Use of the Ski Train would be short-lived, however. Moving the train between Colorado and Coralville was expensive, time consuming, and a low priority for the railroads over whose tracks the ski train needed to traverse. And with the end of the football season coinciding with the start of the ski season, getting the train back to Denver in time proved impractical. Finally, after the ski train was forced to sit in Omaha for four days in 2006 during its transit back to Colorado, a new solution was needed. 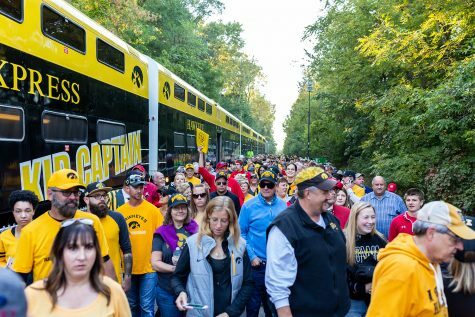 Fans spill out of the Hawkeye Express after its arrival at Kinnick Stadium before the football game against Wisconsin on Saturday, Sept. 22, 2018. To solve this, Sabin and the Iowa Northern looked east instead of west. METRA, the Chicago-area commuter-rail system was in the process of upgrading its commuter rail-car fleet, and the Iowa Northern purchased six commuter cars from METRA. The cars were old, having served in the Chicago area for decades but were still mechanically sound — though keeping the aged heating and air-conditioning systems operational have proved to be a constant challenge to the mechanics of the Iowa Northern. The cars were transported to Oelwein, Iowa, where they were repainted with Iowa colors and then moved onto the Iowa Northern’s yard in Waterloo, where they have formed the basis for the Hawkeye Express ever since. For engines, the Iowa Northern uses the same diesel-electric engines as METRA, with one of them painted in the colors of the old Rock Island Railroad as an homage. Other than an occasional run as a Christmas train, the Hawkeye Express spends the rest of its time idle in Waterloo. Financially, the train has been something of a success as well, or at least revenue neutral. “We never started this as a way to make money. It was strictly a service for the fans,” Jennings said. While the cost to ride has increased over the years to $15, ticket sales have been sufficient, however, to cover the costs of operation, insurance, and leasing the track. One challenge the Hawkeye Express faces is that while the equipment is owned by the Iowa Northern Railroad, the track it runs on is owned by the Iowa Interstate Railroad. Because the Iowa Interstate’s line is single track, for the Hawkeye Express to run, the Iowa Interstate has to shut down its line. While the Hawkeye Express has lasted for 15 years, its future is somewhat cloudy. Henderson said Coralville was largely undeveloped when the train began its service. As once vacant lots along Second Street have filled in, there’s some concern about what happens when the main lots used for parking are sold for development. “IHOP has been good to us,” Jennings said, but he wondered whether every new developer in Coralville would feel the same. Henderson said there are no active plans to consider moving the Coralville stop, although he said the development situation is something officials continue to keep their eyes on.